Hello, Let me tell you a bit about me…..
Like many people I have had a bash at different jobs since leaving university, administration, sales & general management being some of them none of which gave me much job satisfaction. Whenever I wasn’t working I was out riding my bike. I have always been a keen cyclist on & off road. The cycling world was quite male dominant so as a girl I had to look at ways to increase my strength and power just to keep up. This fuelled my interest in the fitness industry generally as well as allowing me to keep up and often beat the boys! 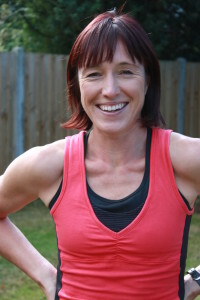 I decided I wanted in on the fitness industry so, after our children started school I retrained as a Personal Trainer. The best career move I ever made, I love it! I feel it is so important to be fit for life not just for sport and love share my passion enthusing others. Get in contact, I hope to meet you soon!